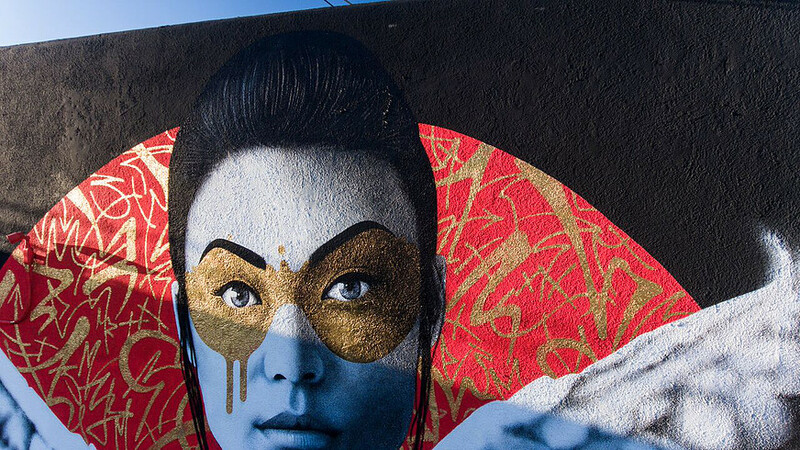 internationally renowned street artist fin dac produced mural 'nabi sonyeo' (butterfly girls) in the koreatown neighborhood of los angeles. 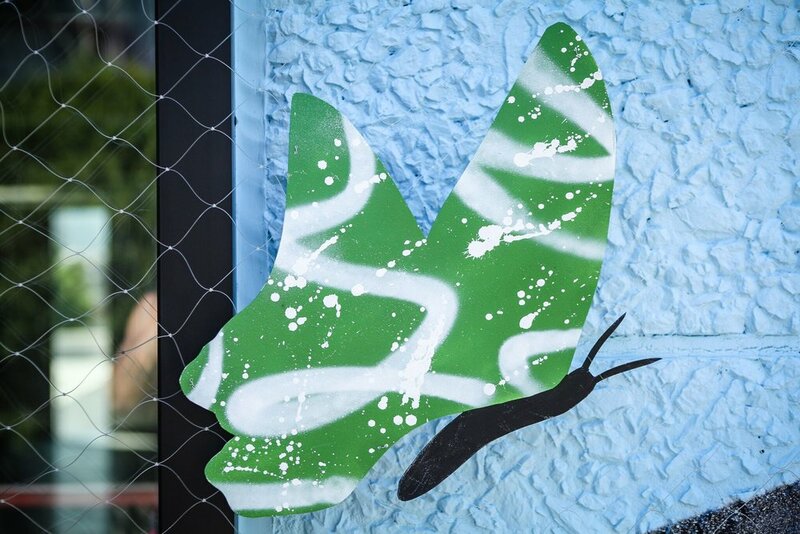 the three paneled mural was erected over the course of two weeks, covered in netting, and mounted with over 90 hand cut butterflies to create a simulation of butterflies fluttering in the breeze. each panel features a different model, two of which are outfitted with traditional korean clothing and one with modern streetwear, to depict a transition from traditional to modern Korean culture. The butterflies serve as a visual metaphor for these changes while uniting the trio in a unique and unexpected way. the up-and-coming brett crawford (aka startvault) was the right hand man and assistant throughout the process, as the two battled the fierce summer heat. 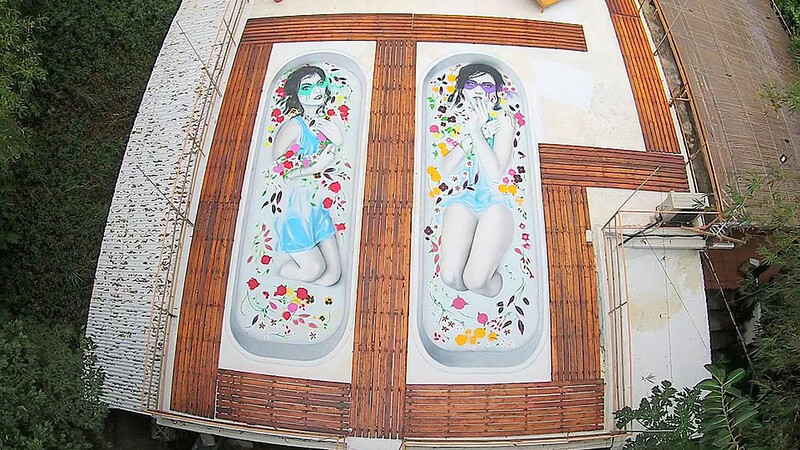 nabi sonyeo is yet another of fin dac’s hidden beauties, a series of work erected in undisclosed locations around the world to create a treasure hunt for its seekers. the work was done for urban offerings and the building is slated to become a creative office space. 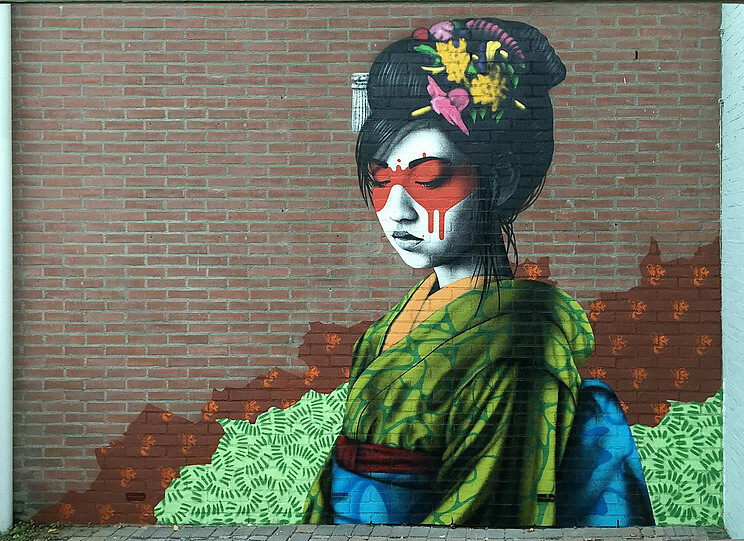 While the goal of most muralists is to create work in high traffic areas, internationally renowned urban artist Fin DAC prefers to send art seekers on a scavenger hunt to find secluded artworks. 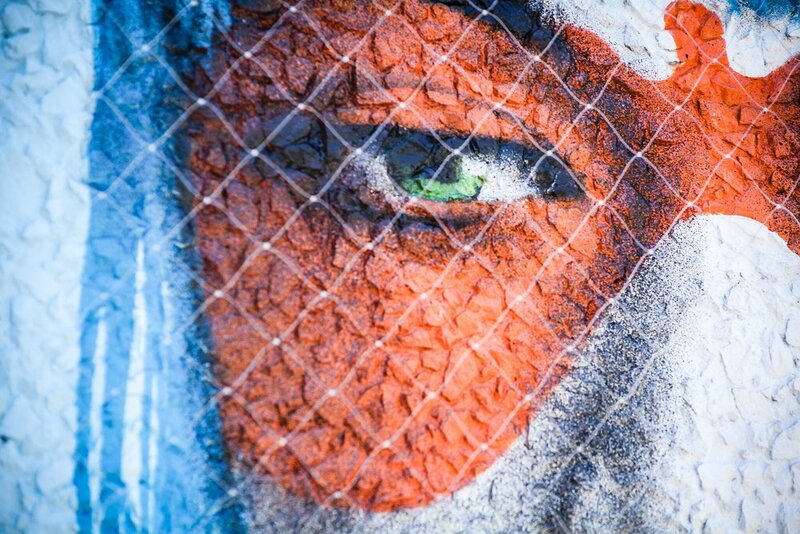 His Hidden Beauty series is a collection of murals that invites fans to explore uncharted territory for the chance to be rewarded with a glimpse of his rarest installations. These works span every corner of the globe and can be discovered in locations as diverse as Australia, Wales, The Netherlands and Hong Kong. After much anticipation, the Urban Aesthetics artist has just revealed Highland Park as the home to his newest addition to this series. 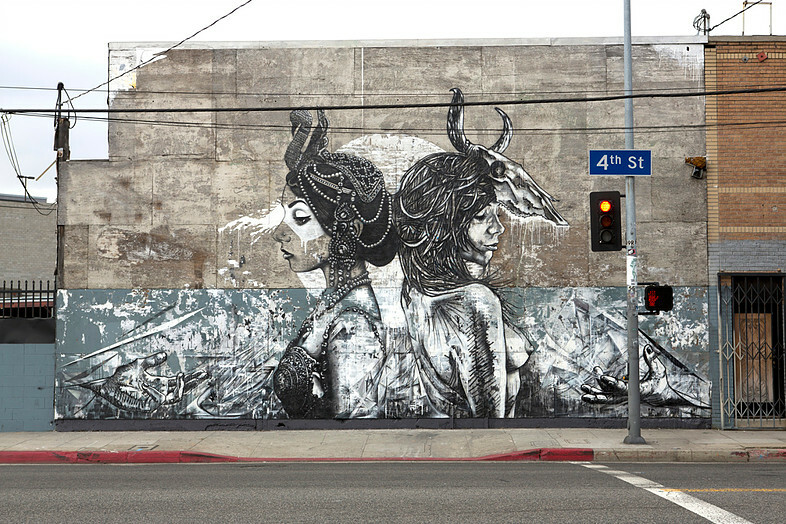 The new mural entitled Resurrection of Angels Part 2 is the Eastside counterpart to his recent West LA mural (Resurrection of Angels Part 1), at The Love Shack in Venice. This isn’t the first time Fin DAC has utilized the concept of angels as a central theme. 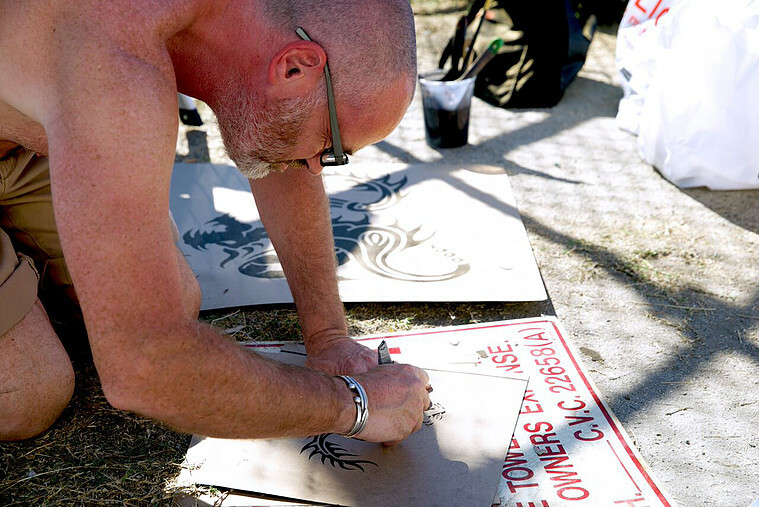 During his first trip to LA a few years ago, he and local duo DTOAR created Redemption of Angels, an iconic mural painted in downtown Los Angeles that survived for several years before being torn down. Los Angeles, known as the City of Angels, may well be the perfect location for the series, but the artist reveals a deeper meaning to the whole concept. The mural was created with the aid of 100% recycled paint donated by montage paint and produced by COlabs, a visual arts consulting firm and production company. Resurrection of Angels Part 2 can be found in the N Figueroa Street area of Highland Park.